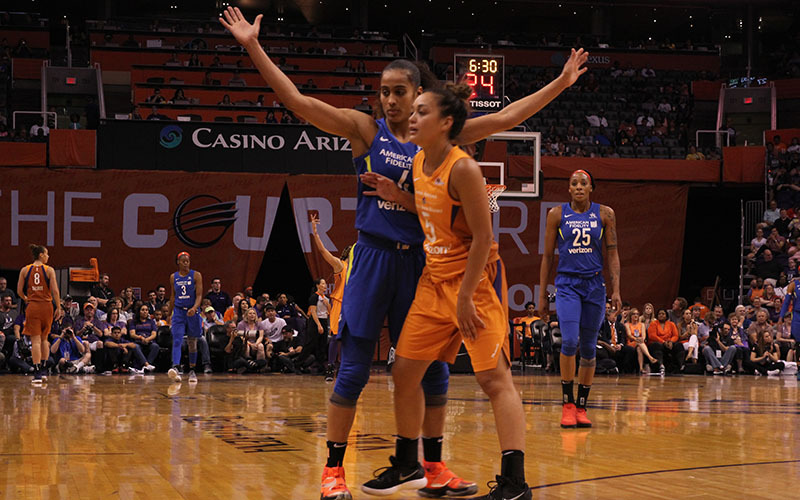 PHOENIX – A frenzied crowd of 11,000 piled into Talking Stick Resort Arena to watch Diana Taurasi, Brittney Griner and Skylar Diggins-Smith, three of the WNBA’s most-recognizable players, tip off the 2018 season. Meanwhile, in New York, league officials were celebrating. The WNBA considers last season one of its most successful, with average game attendance reaching a six-year high and record-breaking numbers in merchandising and social media engagement. However, many of the league’s best players are not as thrilled. They think the NBA, the parent company of the WNBA, could do more in terms of marketing. Unlike other notable American professional sports leagues, the WNBA keeps its revenue figures private, but Lisa Borders, the league’s president, thinks “cultural growth” will lead to economic gain. With nearly 2 million followers across social media platforms, Diggins-Smith is leading the cultural growth that Borders said is so important. The three-time WNBA All-Star is considered the league’s biggest draw. In 2017, when her games were broadcast on Twitter, they typically garnered more than 1 million viewers, which was more than the average MLB game on ESPN, according to Sport Business Daily. She is one of the players who Phoenix Mercury CEO Vincent Kozar thinks the WNBA should get behind to build off last season’s success. The Mercury rank near the top of the league in attendance, and Borders considers them a landmark franchise. Their raucous crowd, known league-wide as the X-Factor, has cheered the team on to three championships. But the Mercury’s top players, Taurasi and Griner, said the 12-team league is flooded with talent. They agree with Diggins-Smith. More could be done to highlight that talent. Prominent players, like Griner, Diggins-Smith and Maya Moore of the Minnesota Lynx, were introduced to America during their college careers. ESPN broadcasts all 63 of the NCAA Division I Women’s Basketball Tournament. Compared to the 14 WNBA regular season games ESPN will televise in 2018, the college game offers women much more exposure. NBA Commissioner Adam Silver said on ESPN’s “Get Up!” that many WNBA teams are still losing money and part of the problem is that the league struggles to attract a younger, female audience. Borders and Kozar both think a continuation of the WNBA’s social media blitz will help bring in that key demographic. On Sunday, four games were broadcast live on Twitter, and 16 more are scheduled to be shown on the website in 2018. This season, they’ll also try something new. Recently, the league launched “Take a Seat, Take a Stand.” With this initiative, for every ticket purchased at certain WNBA games, $5 will be donated to local and national organizations focused on giving women a voice and promoting gender equality, and a girl or young woman will be given a free ticket. As for Taurasi, Griner and Diggins-Smith, they all think the product on the court is the strongest it’s ever been, and that having more teams in more cities would go a long way in increasing the league’s relevance and visibility.